It seems as if the yearly off season tradition of losing a player will continue this year. 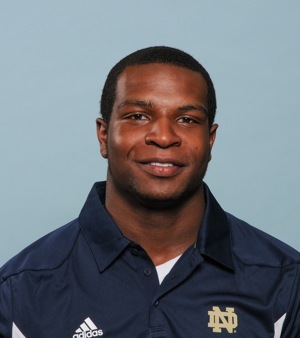 According to reports, Notre Dame running back/wide receiver Will Mahone was arrested on Sunday in Mahoning County, Ohio on multiple charges that include assault of a police officer, resisting arrest, vandalism, and disorderly conduct. News of a Irish football player having “off the field” trouble began circulating earlier today and now we know who that player is. Mahone was a member of the 2012 recruiting class but has been limited with injuries and has not seen much playing time. Last season, the Irish coaching staff moved Mahone from running back to wide receiver to see if he could contribute elsewhere with a logjam of talent at the running back position however that never was able to pan out. The University of Notre Dame has yet to comment on the incident and the ramifications Mahone will face, however it seems that his football career at Notre Dame may be in jeopardy. Previous PostDaniels and Grant Readmitted to Notre DameNext PostITS OFFICIAL! Notre Dame/UGA Home and Home Series is a Go.